Developed by Epson, a leader in sensing technology, the easy-to-use ProSense 307 helps you train like a pro with accuracy and training features for athletes of all levels. Monitor your performance with RouteSense GPS and CardioSense heart rate technologies, which display key stats on the EasyView display. This stylish watch features an intuitive menu and the best GPS battery life in its class*. 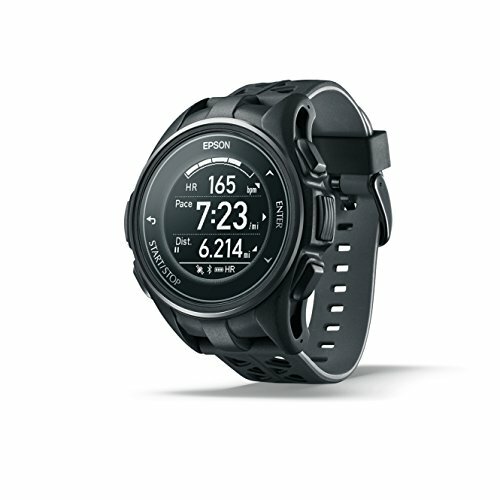 In addition to running, it tracks swimming, cycling and daily activities, automatically transmitting data to the Epson View App** for analysis or goal tracking. Share data** on popular running apps like Runkeeper or Strava. Available in black, blue and white. Built-in GPS - RouteSense GPS technology accurately tracks your route, distance, pace and more. EasyView display - wide-angle, high-contrast screen for superior readability. Easy-to-use menu - easily navigate via 5 simple buttons. #1 GPS battery life in its class* - up to 20 hours with GPS on.